Friday would have been Elvis' 75th birthday. He's not around to celebrate, but the Smithsonian is showcasing the King of Rock 'n' Roll through exhibits opening in D.C. and L.A.
"One Life: Echos of Elvis" opens Friday on the first floor of the National Portrait Gallery. 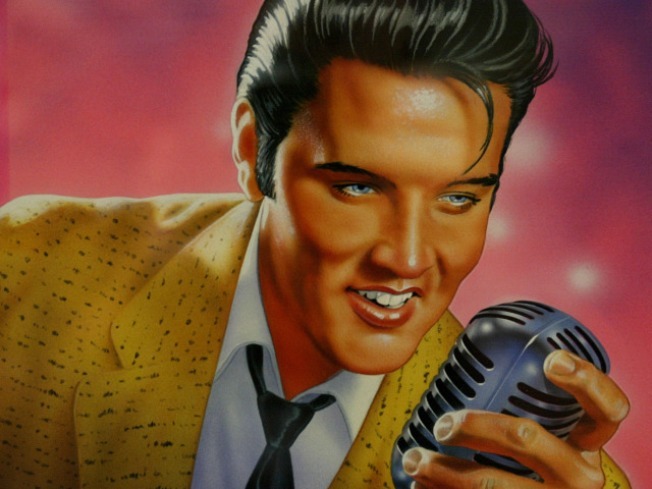 The small, one-room exhibit is devoted to the influence of Presley's image after his death. It features portraits, a gold bust of Elvis as Julius Caesar and a 1993 stamp with his likeness that became the most popular U.S. postal stamp of all time. The exhibit will be open until Aug. 22. In L.A., the Grammy Museum will open the Smithsonian's traveling exhibit, "Elvis at 21: Photographs by Alfred Wertheimer." The photojournalist was hired to shoot promotional images of the young recording artist before he made it big. The show will travel to the Portrait Gallery later this year from Oct. 30 through Jan. 23, 2011.